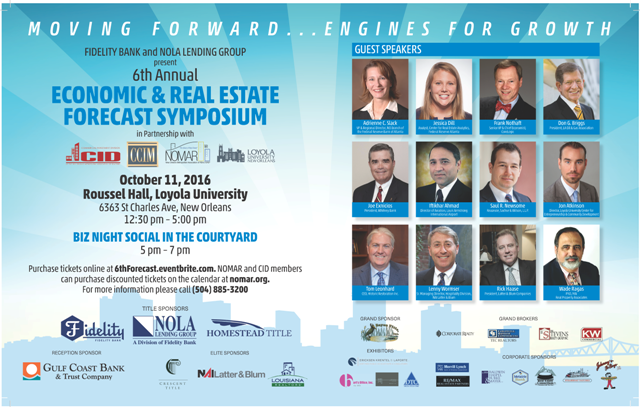 Join us for our Seventh Annual Economic & Real Estate Forecast Symposium on Tuesday, October 10 from 12:30 - 5 p.m. at Loyola University New Orleans. The forecast will be immediately followed by a social in the courtyard with complimentary cocktails and speaker interaction. This event has been approved for 4 hours of Ce for both agents and appraisers! Please click on the speaker's names below to see their presentations. The Annual Economic & Real Estate Forecast continues to attract large audiences because of the quality and reputation of the speakers, a distinguished group of experts in real estate, finance, government and academia, who evaluate and discuss real estate and the financial markets. Many of the best business minds and decision-makers in Louisiana will examine how the political and economic environment will impact real estate and business today and share their expert views on what lies ahead, providing the information and the perspective needed to have the competitive edge to prosper in our changing times. One of the highlights of the event will be the networking reception where the speakers and attendees will socialize and enjoy complimentary cocktails and hors d’oeuvres. NOMAR & CID Members, Click here to register online. Non-members, please click here to register for the forecast. The Forecast has been approved for 4 hours of CE credit. Click here for the Ticket Sponsorship Form. Click here to register online. Click here for the Program and here for a look at the speakers. The 4th Annual NOMAR-CID-CCIM Economic & Real Estate Forecast was held on October 14th at Loyola University. A new afternoon offering, Anatomy of a Public - Private Real Estate Deal: A Case Study, completed the day's programming. Dr. Wade Ragas, Real Property Associates, Inc.
3rd Annual "Economic & Real Estate Forecast"
1st Annual "Economic & Real Estate Forecast"